Department » Watershed Protection » Programs » Creekside Story » Gooey! Slimy! Colorful! What can it possibly be? Gooey! Slimy! Colorful! What can it possibly be? Our Department gets calls from concerned community members about unusual colors seen in creeks. Some of these vibrant colors are natural, so here’s a quick guide to help identify some of the possible sources that cause these unusual sights. Our environmental scientists encounter a lot of strange and colorful things in our creeks. Orange slime, purple fluffy goo, and rainbow sheens on the water would all appear to be pollution problems, but often it is just a natural phenomenon. Each of these things can be harmless bacteria just doing what they normally do, which is abnormally fascinating. If you suspect what you are seeing is not naturally occurring and a pollution source might be involved, call the City’s 24-Hour Pollution Hotline (512/974-2550) to initiate an investigation. A bright orange slime is often seen where groundwater seeps out of the ground. The slime is called “ferrihydrite” and is basically like rust that is made by bacteria. Iron-reducing bacteria underground turn insoluble iron into dissolved iron hydroxide molecules in the absence of oxygen. These dissolved iron molecules can flow in groundwater to the surface. After the dissolved iron hydroxide molecules flow to the surface, a different group of bacteria use oxygen to oxidize the iron and create an insoluble form of iron called ferrihydrite (the orange slime) as a byproduct. This complex chemical relationship has been present on the earth for hundreds of millions of years, and although it looks gross, it is natural and harmless. These gooey orange slimes were observed flowing into Little Walnut and Blunn Creek. This oily-sheen is made of a film of a rod-shaped bacteria called Leptothrix discophora. The bacteria oxidize dissolved iron and manganese for energy and secrete proteins and carbohydrates. They are lined up end-to-end within sheathes and are stuck together side-by-side in rows. Sunlight refracts off the sheaths, proteins and carbohydrates to make shiny rainbow colors. The bacteria stick to the surface of water with tiny donut-shaped structures on the sheathes. The way they are aligned and stick to the surface of the water causes the biofilm to float at the surface and “shatter” like glass when disturbed. Real oil is greasy and will stick together refusing to shatter like these bacteria. Sometimes these biofilms are present where iron and manganese in groundwater come to the surface, and sometimes they are wrapped around air bubbles in packs of leaves underwater. These are not bad bacteria, and in fact, they are beneficial because they process metals in water. They are beautiful, natural and harmless. 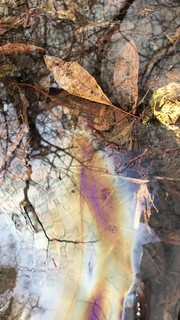 These oily-sheens floating on water in Spicewood tributary are not oil. A purple coloration that can develop in stagnant, well lit, waters may be a bacterial group known as “purple sulfur bacteria”. These organisms are capable of photosynthesis, which is why they need sunlight. They don’t use chlorophyll like plants, instead they use “bacteriochlorophyll” pigments as well as carotenoids which make the purple color. Purple sulfur bacteria also require their water to have two key characteristics. The water must have hydrogen sulfide, and cannot have oxygen. They get their hydrogen sulfide from other bacteria that reduce sulfate in the water or soil rich in organic matter and devoid of oxygen. The purple sulfur bacteria are good because they take the hydrogen sulfide (stinky and toxic) and turn it into harmless elemental sulfur. The conditions must be just right for both types of bacteria to thrive. Just like the orange and rainbow bacteria, these organisms are natural and harmless. These purple sulfur bacteria were observed at Givens Park. All of these bacteria thrive under very special conditions and depend on other bacteria for their survival. We usually associate life with oxygen, but these bacterial communities depend on a source of water that is devoid of oxygen. Creekside areas are complex, fascinating and wonderful places full of surprises and interesting biological and chemical phenomenon. Check out our Water Quality Color Guide to learn more about what’s in our water! Call our pollution hotline at 512-974-2550 if you suspect a pollution spill.